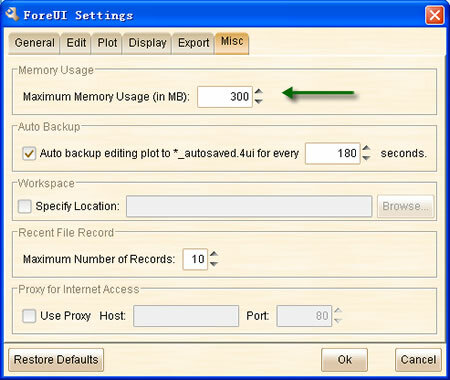 ForeUI V2.52: Rectangle Borders, Memory Monitor, Auto-Save etc. Hello folks, ForeUI V2.52 is out today. If you have installed V2.50, you can update to V2.52 directly via the updater. With this new feature, the Rectangle element can be used to represent more complex shapes. I found it is very suitable for custom tab creation. During our daily custom service, we realize some problems are caused by the insufficient memory. Like other Java applications, ForeUI has to specify the maximum memory usage at the launching time. The default maximum memory usage is set to 300 MB and it is enough for normal cases. However if your plot is big and complex, and you have done many operations, the increasing Redo/Undo records may challenge the 300 MB limitation. Once that happen, ForeUI may behave sluggish and sometimes can not execute your command. Now the new version allows you to monitor the actual memory usage and configure the maximum memory usage. You will need to restart ForeUI to take effect the maximum memory usage setting. To avoid losing your work, we implemented the auto saving feature, and it is now turned on by default. It will try to backup your current editing plot (say Test.4ui) to “Test_autosaved.4ui” in the same directory for every 3 minutes. When auto saving is performed, a message will be displayed for a few seconds on the top-left corner of the editing area. You can change the auto saving interval in the “Misc” tab of the settings window, or even turn it off if you don’t want it. This is requested by Ed. Now you can insert this element property into expression to check whether the element is visible during the simulation. From this version, ForeUI will use system look and feel by default in Mac OS X. In Windows the Ok button is usually on left and Cancel button is usually on right; In Mac OS the order is reversed. So we adjust the position of “Ok” and “Cancel” buttons for Mac OS X in this version. Do not show action indicator (small red flag) on embedded element that is hidden by container. Remember the file chooser view type. 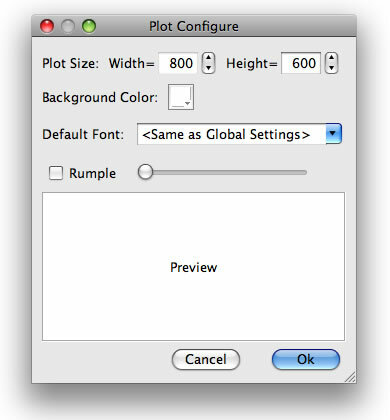 Bug_0249: Tabs element has incorrect hotspots in “Mac OS X” theme (under editing mode). 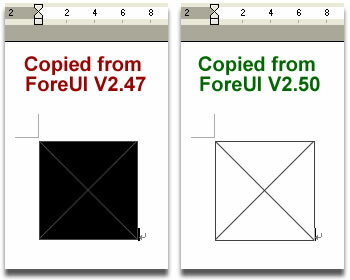 Hello everybody, we are pleased to release ForeUI V2.50 today. 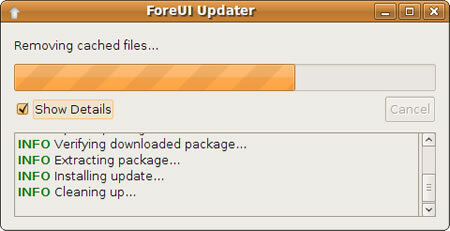 From this version a brand new auto updater of ForeUI will be available. Since we update ForeUI frequently, an updater that can download and install updates automatically is really useful. From V2.50, the updater will be shipped with every downloadable package. 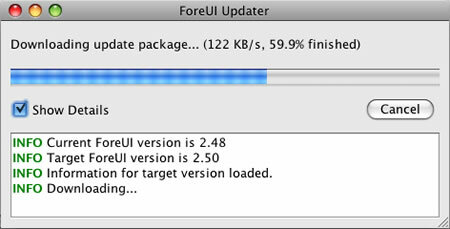 When you launch ForeUI, it will detect the new version from Internet. If new version exist, ForeUI will ask whether to update, if you choose “Yes, Sure”, ForeUI will quit and the updater will be launched. The updater can work under Windows, Mac OS X and Linux systems. With this updater, releasing minor version for bug fixings become much easier. If we confirm a serious bug, we can fix it immediately and push the update package to all users. The new version has the same major version number with the old version. The license is purchased within one year. The first condition exists at the very beginning, and the second condition is added in this update. For existing ForeUI users, this change may bring you several months’ free upgrade period, without any additional payment. For coming ForeUI users, this change is also a good news, since you will have free upgrade for at least one year, even another major version will be released soon. The chart is created with ForeUI, and you can run its interactive simulation here.